Become Career » How Do You Become a Paralegal? If you have always wanted to join the fascinating legal field, but are not interested in the rigorous commitment needed to attend law school, then you may wish to become a paralegal. 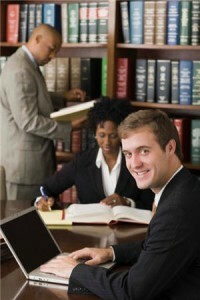 As a vital member of the legal team for assisting attorneys in their daily proceedings, paralegals are typically responsible for conducting research, maintaining records, arranging evidence, writing reports, drafting legal documents, pursuing affidavits, reviewing trial transcripts, filing appeals, and contacting clients or witnesses to schedule interviews. While most are employed in legal services, job opportunities for paralegals also exist within law libraries, financial services, insurance companies, and government agencies, according to the Bureau of Labor Statistics. In order to reach your professional aspirations, the following is a step-by-step guide on how you can become a paralegal. Employers sometimes hire high school graduates with relevant legal work experience and no post-secondary education, but most paralegals have at least a two-year associate’s degree from a community college. Through a combination of paralegal training, legal research, and other academic subjects, associate’s degree programs are focused on improving the technical skills needed for success in the field. Some universities nationwide also offer the opportunity to pursue a bachelor’s or master’s degree related to paralegal studies for more advanced positions in supervising other paralegals and administrative staff. If you have already received a bachelor’s degree in another major, there are also certificate programs in paralegal studies that offer intensive training within just a few months. Although some employers will hire entry-level paralegals without any experience and provide them with on-the-job training, the most promising job prospects are present for paralegals who have significant hands-on experience within the legal field. In most cases, employers will prefer job candidates who have obtained at least one year of experience working in a law firm or other office setting with a specific legal specialty. It is recommended that you find a job or internship within a law office completing administrative duties, including filing records, answering telephones, and assisting other paralegals. Not only will these experiences dazzle on a resume, but they will also provide a familiarity in the legal environment and offer a valuable opportunity to network with professionals already in the field. In order to receive an advantage over other candidates in today’s competitive job market, you may also want to consider pursuing professional credentials with paralegal certification. After graduating with an associate’s or bachelor’s degree related to paralegal studies, students are typically eligible for earning voluntary certification by passing a comprehensive examination with certain levels of work experience. Paralegal certification is currently offered through the National Federation of Paralegal Associations (NFPA) through the completion of the Paralegal CORE Competency Exam or Paralegal Advanced Competency Exam (PACE). To maintain certification, you will need to complete at least eight hours of continuing education classes every two years to stay current on updated legal practices. Overall, becoming a paralegal will require you to develop a broad understanding of the legal field through a combination of post-secondary education and on-the-job training in law offices. Once you build the solid communication, interpersonal, organizational, investigative, and computer skills needed to become a paralegal, you will enjoy promising job prospects as the employment of paralegals is expected to grow rapidly by 17% before 2022 to enhance the efficiency of legal services.